Telcare Retention Services is a firm which conducts opinion research for companies, most of which is focused on gathering data about customer satisfaction. Telcare's stated mission is to help companies with customer retention by taking the mystery out of the “customer experience” side of the equation. Armed with this information, companies are better able to make strategic adjustments and improve their performance in various ways. 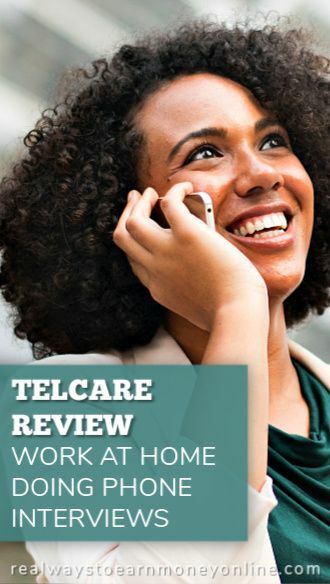 Telcare hires home-based survey agents to handle most of the phone work for their research projects. If hired, you'll be tasked with calling people and asking them questions about products or services they've paid for to determine their level of satisfaction. Some projects also involve making calls to companies that are part of larger distribution chains, probably to check for problems with the firms above or below them in the hierarchy. According to Telcare's hiring site, most surveys are pretty short – around 10 questions – but some can have 60 questions or more. The recruitment page stresses that this job involves no telemarketing at all, which means this is one of the very rare phone jobs that might be good for people who feel uncomfortable selling things. You'll need a quiet location in your home to work from – a standard requirement for virtually all phone jobs – and the company gives a strong preference to people with English/Spanish bilingual skills. Prior experience in phone customer service is also helpful, but not mandatory. Calls are conducted over the internet using a VOIP tool that they'll provide you, and you'll need to connect a headset to your computer. There is no mention of whether or not Telcare supplies the headset, so it's probably best to assume they don't. You'll also need a cable or DSL broadband connection, along with a Windows-based computer that can run Internet Explorer 7.0. The browser requirement seems odd because Chrome or Firefox are the browsers of choice these days for both business and personal use. Internet Explorer is a relic, and the fact that they make it mandatory suggests their VOIP software must be pretty old. If you have Windows 10, it's very possible that your current computer doesn't have Internet Explorer currently enabled – Edge is Microsoft's default browser now – but it should still be possible to run IE if you need to. However, the version of Internet Explorer available on newer PCs is 11.0, which is much newer than the version Telcare mandates. It may not be possible (or at least not easy) to run a much older version of the software on the newer OS, so you should keep that in mind. Telcare pays their survey agents $12 per hour. You will be hired as an independent contractor rather than an employee, so there's no eligibility for overtime or holiday pay, and they don't offer health insurance or any other benefits. According to the hiring page, there are various projects on offer at any given time with slightly different hour requirements. The projects currently available are for people willing to work 20 to 40 hours a week, but sometimes they have projects that only require 3 to 6 hours per week. You can work on multiple projects at once, splitting your hours between them. Your work schedule will be based on your own time zone, so no matter where you live, you'll be working between the hours of 9:00 a.m. and 5:00 p.m. For the smaller projects that only require 3 to 6 hours a week, you'll be working from 9:00 a.m. to 12:00 p.m. It sounds like there is some level of flexibility for exactly when you put in your hours, as long as you meet the minimums for the projects you're assigned to. Telcare provides very little information on their hiring site on the specifics of their application or interview processes. From what I can tell, you just send them a resume and then wait to see if they get back in touch with you. If hired, you'll have to attend one week of unpaid remote training, presumably via videoconferencing. The nature of this training and the number hours are required are not disclosed. I looked all over the web for feedback on Telcare, including all the job review sites and every relevant Facebook group I know of. Despite all the digging, I only found a single review on Glassdoor from a former survey agent. Unfortunately, this person didn't like the job at all. The complaints were mostly related to old, buggy computer software, which makes a lot of sense in relation to the company's Internet Explorer browser requirement. One thing I did find a lot of during my research were comments from people who had applied and never heard back, which may explain the overall lack of reviews. It looks like Telcare may not actually hire that many people overall. The one Glassdoor review I did find was from all the way back 2017. Still, if you're interested in phone work but don't enjoy sales, it might be a good idea to put in an application here, just to be on file next time they start hiring. Companies are constantly growing and changing, so Telcare might get really busy and start adding lots of new people at some point in the near future. If you like the sound of this job, and want to learn more, go here to read more about the company and send them your resume. Looking For Even More Remote Jobs In Other Industries? You might want to consider a membership to FlexJobs, the most trusted job board with flexible and remote work that is guaranteed to be scam-free. I have a membership here myself and I really like it! If you decide to try it, you can get 30 percent off the already small membership fee with promo code AFFILPROMO. Canceling is very easy if you don't find it meets your needs. Who are you working for now doing telephone surveys?